By combining a sensitive look and textile touch with energy-saving light technology, Christian Haas creates a never seen before light source design object. Each of the Ropes varies in size and technique. None of them is a reproduction of the other. Each is unique and numbered. The Ropes are handmade in France and Germany. The textile cord outside is robust, weatherproof, water and dirt repellent. 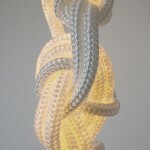 The light source inside the textile cord consists of warm-light LEDs with a durability of roundabout 50.000 hours (more than 17 years, if you leave them lit 8 hours per day).